The early start of the day and autumn cold didn’t deter our ELESIG NW participants! ELESIG is a Special interest Group of those interested in Learner Experience Research with a focus on technology. There are a number of regional groups now: in London, Midlands, Scotland. Wales and with an ELESIG South forming in December this year. Thanks to all the speakers, participant contributions and Roger Harrison, ELESIG NW co-conveyor, University of Manchester, who ensured the smooth running of the day. Damian Keil and Adam Palin from MMU started off the day talking about their development of e-learning resources in a sport sciences course using iBooks. Each student worked with the electronic learning materials on an iPad. We got an insight into the development process, the scale of the investment and benefits for the students. These were evidenced by observing exam results, surveys and focus groups. Participants interested in developing quality resources or engaging students in a distance learning course all took an interest in this initiative. In the Members’ corner section, a ten-minute appetiser format allowed ELESIG members to talk about their research plans or table ideas for feedback and discussion. First, we heard from Huw Morgan in the Salford Business School, who developed video resources and adopted a flipped classroom approach with his students. We got an insight into student patterns using these videos for their learning. Jim Turner, our #elesig tweeter on the day even had his tweet about Huw Morgan’s #elesig presentation retweeted by Eric Mazur! This was another example of developing an active learning approach with some useful learning points from Huw. 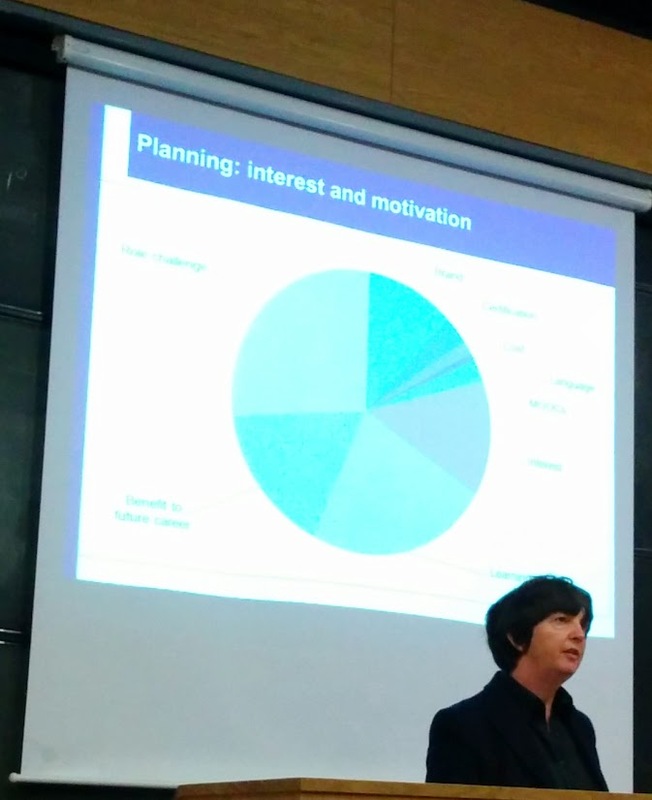 Second up was, Roger Harrison, who proposed the question ‘What strategies can we use to evaluate PG distance learning programmes?’ Finally, Carol Wakeford, University of Manchester, Life Sciences also put forward an evaluation challenge in their third year undergraduate module. This module has students design, create and evaluate an e-learning resource. Carol wanted to elicit strategies from ELESIG participants on overcoming the problem of not having enough student volunteers to do the evaluation of these resources. The discussion that followed the appetiser presentations showed that this was a helpful and engaging format. It’s always useful to hear what colleagues are working on and how they are formulating and overcoming challenges of curriculum design and evaluation of learner experiences. Just-before our tea break, Roger managed to engage us in a vibrant discussion: we had to imagine how we would evaluate our ‘student’ (a dog) if they couldn’t speak? This inspired activity certainly made us think of a repertoire of evaluation strategies available to us! Professor Allison Littlejohn’s ‘Seeing the invisible: understanding learner experiences’ challenged us to think of the meaning-making process of student learning data. Utilising Zimermann’s theory of self-regulation, their team of researchers investigated the activities and strategies that adult learners use to self-regulate their learning in the context of a MOOC. Resources arising from a project on investigating professional learning in MOOCs are also available on their website – a useful resource for anyone interested in professional learning or in MOOCs (see also References below). Conclusions were drawn examining learning behaviour of those who perceived themselves high- and low self-regulators. For instance, high regulators focused on the learning and performance, low regulators focused on the participation in the MOOC! The study also concluded that the learning environment had an effect on the way participants learned, irrespective whether they perceived themselves high- or low self-regulators. To me, the keynote was an excellent demonstration how quality insights can be gained from research underpinned by theory. 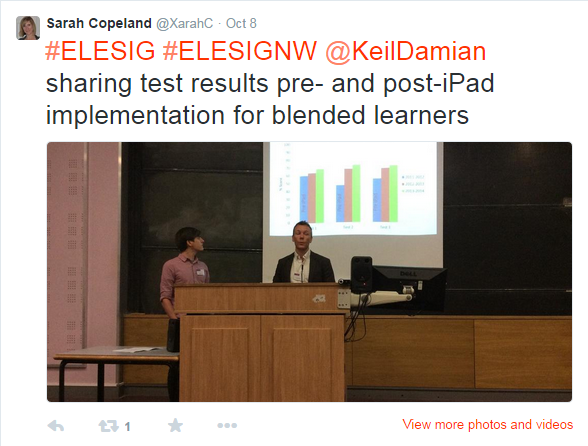 “The NW ELESIG was an example of a network of practitioners striving to ‘do things better’ by capitalising on and contributing to knowledge of how students can take forward their own learning. Theories and concepts generated in other arenas can inform what we do in higher education, though they have to be tested and (sometimes) reimagined. The key message I hope people take from my presentation on ‘Seeing the Invisible’ is the importance of theory and methodology underpinning data gathering and interpretation. All too often rigour is missing from technology-enhanced learning, yet there are lots of theories, methods and conceptual tools for us to draw from. For your diary: next ELESIG NW event: 25 Feb 2015 – Keynote from Professor Martin Oliver, hosted by Liverpool John Moores University & Jim Turner, co-convenor of ELESIG NW. If learner experience research is an area you are interested in, do join the ELESIG ning site and come along to one of our events. You can also follow @ELESIG on Twitter! ELESIG NW Mendeley group – we are adding useful references here, please do join the group and contribute to the resources too. ELESIG – we have a ning site with resources and details of funding, do join and have a browse.